A holiday classic you can’t pass up! 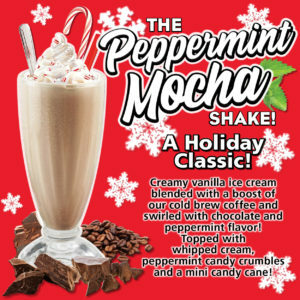 We are excited to launch our December Shake of the Month, the Peppermint Mocha Shake! Our creamy vanilla ice cream is blended with a boost of our cold brew coffee and swirled with chocolate and peppermint flavors! Topped with whipped cream, peppermint candy crumbles and a mini candy cane! For the kids and non coffee fans, we do offer this festive shake without coffee. This treat will be available from December 1st 2018 – December 31st 2018. Shooby Dooby down to Ruby’s to try it before it’s gone! The Peppermint Mocha Shake will be available from December 1st, 2018 – December 31st, 2018 at participating locations. Please give your local Ruby’s Diner a call to see if the Peppermint Mocha Shake is available near you! The Shake of the Month limited time offer excludes casino, airport, sporting venue & food court locations. To see a list of all of Ruby’s Diner locations, please click here.